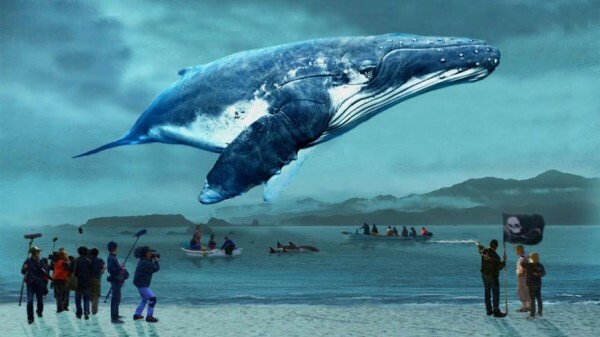 Megumi Sasaki's A Whale of a Tale is a response to Louie Psihoyos' Oscar-winnning 2009 documentary The Cove, a film that read like a thriller. To make The Cove, a mostly American team with state-of-the-art surveillance and film equipment, bypassing the local authorities, investigated the dolphin hunt at Taiji, a small Japanese coastal town where the animals are captured and killed in high numbers every autumn. Sasaki's aim is to show that there is another side to the story. She is greatly aided in the task by being a Japanese woman, therefore non-threatening, and most importantly able to understand Japanese. Through her, in this film, reportedly the product of six years of research, we get to know much better the people of Taiji who are seen only from a distance, largely as brutal slaughterers, in Louie Psihoyos' film. Sasaki is a Japanese filmmaker based in New York. Her first film, Herb and Dorotny (2008), is a memorable one about the unique couple who with limited means and living in a small apartment yet managed to assemble a world-class collection of contemporary art. This more pedestrian, quieter film than The Cove seems to have had more trouble getting funded and distributed. But it is essential to complete the picture. After seeing it, you will realize that the exciting aspects of The Cove, which I called "an eco-terrorist documentary," come along with its being strident and one-sided. It is blatant advocacy. If Sasaki's film is advocacy, it's of a gentler, more balanced kind. In A Whale of a Tale we meet the people of Taiji, not all, by any means, but the mayor, ordinary citizens, and, notably, the fishermen. We learn that, though tourism is a growing source of income, the ecology of Taiji provides few other sources of income besides fishing. It is a tradition going back 400 years there. We learn the fishermen respect and honor their catch, praying to it and thanking it like Native Americans, and that the small number of dolphin species caught or killed at Taiji are non endangered ones. We learn dolphins are not sacrosanct in Japan as elsewhere but regarded (if inaccurately) as just fish. The fishermen are respectable chaps, decent, clean-living family men, we feel, from Sasaki's empathic, intimate portrait. She is, however, also sympathetic to the Sea Shepherd animal rights activists who hound the Taaiji dolphin fishermen constantly, several of whose leaders we hear from repeatedly, including former dolphin trainer Ric O’Barry, a key figure of The Cove. Nonetheless what you may come away with is the quiet respectability of the local fishermen and the rude, vulgar taunts and threats the rank and file Sea Shepherd activists shout at them, when they're there. Sasaki talks to Japanese anti-whaling activists, who point out that Sea Shepherd is hurting, not helping their cause (and never cooperates with them or with the locals). Sasaki also covers a big public debate, two sides seated on opposite sides of a hall, between the forces of Sea Shepherd and the town of Taiji. They reach no agreement, but they are talking now. We do not get a look at Japan and ecology in general, at the Japanese fishing industry, the statistics, how Taiji fits into that. But we learn that even in Taiji, the Japanese are consuming less and less dolphin meat, even if they've found its mercury content is not too dangerous. However, the activists' attacks have led the Japanese to support whale meat consumption in resistance. As a [i]Japan Times[/o] article puts it, "One reason Japan still hunts whales is to show that it isn’t cowed by gaiatsu (outside pressure)." It is also true that sale of live dolphins, caught at the annual hunt, to aqua shows around the world, is the main source of income now, and that goes on. We also meet, incidentally, but nonetheless memorably, an American journalist called Jay Alabaster, long resident in Tokyo, fluent in Japanese. Alabaster decides to follow the story The Cove brought up. He goes to live temporarily in Taiji and, patient fellow that he is, spends several years there. How he supports himself isn't quite clear. But watch him dining and drinking with a group of local male friends. They may be performing a little bit for Sasaki's camera, but they firmly accept him as one of their own. Alabaster becomes our, the Anglo viewers', personal representative of this film's humane and satisfying process of making nice with the Taiji population. To know and to understand is to forgive. He also tries to help locals to come to understand the importance of social media, especially Twitter, in presenting their cause. The Japanese, the film says, have generally little awareness of publicity. The animal welfare activists like Sea Shepherd are experts at it. They are winning the argument on the world stage, the film shows, because today the voice heard in the world is the louder, more media-savvy one. Sasaki does not film the annual mass slaughter of dolphins that was shown in Louie Psihoyos' infamous "cove," The locals did not want that to be seen, remember? The fishermen say they have developed a technique of plugging the dolphins' wounds so the water isn't filled with blood now. They say the method of killing is humane. The issue of whether dolphins should be killed at all is somewhat moot. Taiji still is somewhat in a bind. The locals' claim that the many representations of dolphins in large images and sculptures around the town prove they revere the animals isn't totally convincing. All the images of steers out West don't mean cattle are humanely treated in America. The arguments presented in Sasaki's film remind us to consider that most of us continue to eat fish and meat. As long as we do so, we will slaughter them. It begins to look as if Louie Psihoyos trapped the town of Taiji as the Taiji fishermen trap the dolphins. Taiji was too easy a target, made the more so by its being Asian, not American. Sasaki humanizes Taiji. After seeing her film, it's not so easy to condemn the place or its way of life. Louie Psihoyos' prizewinner, a powerful and bold blend of gonzo filmmaking and expensive state-of-the-art equipment, is a great attention-getter whose righteous indignation A Whale of a Tale's moderation and balance calls Psihoyos' into question. A Whale of a Tale/Okujirasama: Futatsu no Seigi no Monogatari ("The Honorable Whale: Two Stories of Justice"), 97 mins., debuted 7 Sept. 2017 at Busan. It was shown in four other festivals, including the Japan Cuts series in New York last July, and has been seen in screenings at private settings like the Japan Society and the Asia Society. It screens 7 Sept. 2018 at Alamo Drafthouse New Mission Theater in San Francisco. An article in The Japan Times, based on an interview, presents Sasaki's personal point of view in making A Whale of a Tale. Another Japan Times article, by Philip Brasor, differentiates Sasaki's film from a more partisan response to The Cove out at the same time by first-time filmmaker Keiko Yagi. Shown 17–23 Aug. 2018 at Quad Cinema, NYC. ; 24-30 Laemle Music Hall, Los Angeles. Opens 7 Sept. 2018 Alamo Drafthouse New Mission Theater in San Francisco. Last edited by Chris Knipp; 09-06-2018 at 12:44 PM.